Modules for routing and mixing audio or -more often- modulation signals. same as above, with 8 in & outputs. 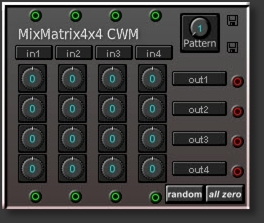 4x4 mixmatrix with randomize function and "All Zero" button to force all controls to value 0. 128 patterns can be selected via "Pattern" control. Inputs are connected through for daisy-chaining several matrices. Preset list 1 for all values; list 2 for naming input sources. 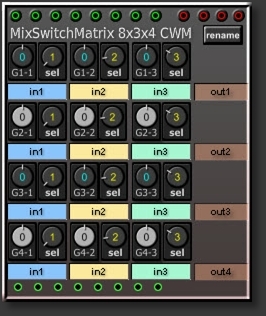 -8 inputs can be routed to 3 matrix inputs. 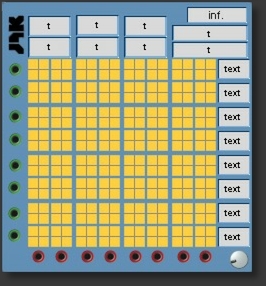 -input text for each of the 8 inputs, which can be edited in a separate panel (click “rename”). -the upper input pads are connected through to the pads on the bottom of the module, to connect multiple valMat8x3x4 modules with the same modulation inputs. 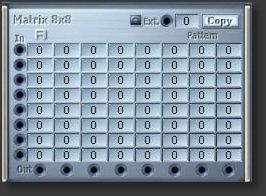 All cwm matrices' outputs have fb destroyers, so any matrix input can connected to itself, if wanted (eg lfo out -> lfo rateMod). module is available on Ben Walker’s website. 32in 12out resp. 55in 11out switch matrices.